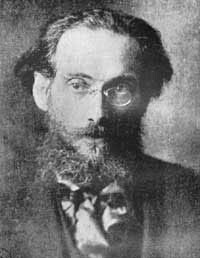 Landauer was the founder, in 1908, of the german “Sozialistisches Bund” (Socialist Federation). This organisation had the aim of bringing about socialism by starting rural, self-managed, egalitarian communities, uniting agricultural, industrial and artisan work into a harmonious whole. He was most important theoretician of communitarian anarchism in Germany during the pre-WW1 period. Many members of the community movement of the time saw him as being the theoretician of their movement too. At least one german community was named after him. Author of “Die Siedlung” (The settlement), 3rd Paper of the Socialist Federation. Written in 1910 as a propaganda leaflet for the pre-WW1 libertarian socialist organisation, “Sozialistisches Bund”, this was the most important and influential of his writings about community. In this and other works he propagated the idea of communal settlements as being the first practical steps to achieving socialism. He believed that groups of strong willed activists sharing similar ideas should go out on the land and form “face-to-face”, human scale communities which would be federated together in networks while maintaining a high degree of autonomy. Here the members would work and live collectively, creating the new “communist” society. Landauer thought that the trade unions and the co-operative movement should support the new communal settlements, both financially and materially. “Depending on our possibilities we want to end our participation in capitalism. We want to start socialist farms and socialist villages. We want to unite the labourers in agriculture with the factory workers. We want, as far as we can, to produce to satisfy our own needs, and if we only begin now, the easier it will always become, and soon we will be able to conduct exchange on our own social market and avoid the capitalist one.” Die Siedlung, 1910. “The earth, from which everything comes which we then process in industry, and from which all our foodstuff comes, is a part of nature, like the air that we breathe, like light and warmth, without which there is no life. Like air and light, earth and water must be free.” Die Siedlung, 1910. In 1900, he was, for a while, a member of the “Neue Gemeinschaft” (new community) in Berlin, where he met Erich Mühsam and Martin Buber, both of whom helped found the Socialist Federation. While later living in England he was authorised by Peter Kropotkin himself to translate the books “Fields, factories and workshops” and “Mutual Aid” into German. He also contributed to the paper, Freedom. He was Minister for Education, Science and Art in the anarchist council republic proclaimed in Munich in April, 1919. He was one of the first victims of the “white terror” being murdered on the 2nd May, 1919. Gustav Landauer, “Revolution and other writings”, A Political Reader, Edited and Translated by Gabriel Kuhn, PM Press 2010, ISBN 978-1-60486-054-2.